During this June’s National Safety Month, Utilities Employees Credit Union representatives are visiting utility and energy worker summer safety fairs to connect industry employees and their families with financial safety and wellness benefits. Utility companies have found these meetings beneficial to address financial safety and financial wellness – both during National Safety Month and year-round. During National Safety Month, Utilities Employees Credit Union (UECU) is providing financial safety and financial wellness programs for the utility and energy industry workers and family members, who make up its nationwide membership. While UECU conducts educational programs year-round, its June programs during National Safety Month have a special importance, given the role financial wellness plays in reducing worker distractions and promoting greater worker safety and productivity. UECU offers energy, utility, and related-industry companies free, voluntary financial benefits they can extend to workers and their families to promote financial wellness, reduce company health care costs, and enhance worker productivity. UECU’s representatives regularly visit company partners during worker safety meetings and wellness events to offer educational programs on a variety of financial wellness topics, and to share information about financial services offered through the credit union. “Companies have found these meetings beneficial to address financial wellness and safety for small groups of 15 to 20 employees to larger gatherings of hundreds of workers,” says Suzanne Valencia, Business Development Associate for UECU. During this year’s National Safety Month, UECU representatives will visit workers in locations across the eastern U.S. – attending summer safety events and fairs for power linemen, electric and gas generation employees, telecommunication workers, and professionals from other sectors of the utility and energy industries. UECU’s financial education topics have spanned general concepts such as financial wellness for families, as well as specific topics like building a positive credit history, understanding lending products, credit score factors, and best practices for credit card usage. Many of UECU’s deposit accounts, loan products, and financial services offer financial safety benefits and UECU also extends a discount on identity theft coverage to its members, and even a free subscription to identity protection service as a financial reward for members using multiple credit union products and services. UECU offers members mobile text and email alerts so they can monitor account activities, and electronic alternatives to theft-prone paper financial records, such as secure online home banking and secure electronic account statements. UECU’s VISA® Power Card™, a no-annual-fee credit card, also comes with a series of free, built-in safety and travel protections – identity theft protection, fraud protection, online shopping protection, and travel accident and auto rental insurances. The card’s fraud protection and international service include notifications of suspected unauthorized usage and VISA® Global Assistance for card replacement and emergency cash, in the event that a card is lost or stolen while members are traveling. In recent years, UECU has added more financial wellness programs and literature to its wide array of financial services, to better serve the current needs of the utility workers and families its served since 1934. Each year, worker health and benefits studies such as the annual MetLife Employee Benefits Study report lost productivity, employee absences, and increased health care costs related to financial stress. In an economic climate where companies cannot always offer additional financial compensation to their workers, voluntary benefits can provide alternative relief for employees. UECU provides nationwide access to financial products and services, credit counseling, and financial education to utility and energy workers. The credit union offers additional employee promotions, benefits support, and financial education services to industry companies and professional associations that offer membership as a worker benefit. Some companies offer UECU membership as a stand-alone benefit, while others incorporate it as part of a company financial wellness program or employee assistance program. 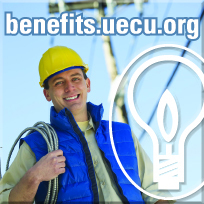 To obtain information on providing employee financial benefits through Utilities Employees Credit Union, companies in the utility, energy, or related industries can visit benefits.uecu.org or call 800-288-6423, extension 6034.